yome tataki 嫁叩き　"hitting the bride"
shuugiboo, shuugi boo 祝儀棒 "festival stick"
iwaiboo, iwai boo 祝い棒　"festival stick"
It is used to induce fertility, either in the bride of a home or for the fields. The thicker parts are made from special cuttings and shavings of wood. The use of this stick is very old in the Yokote region. It was sold on the first festival for the deity Bonten, hence the name. 三所神社梵天奉納祭 at the shrine Sanjo Jinja 三所神社.
. Bonden Festival in Akita 梵天祭り. (it used to be the 17th of the first lunar month) and has a history of more than 250 years. 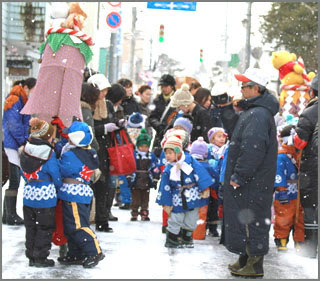 In the local dialect, it is called "Bonden matsuri". 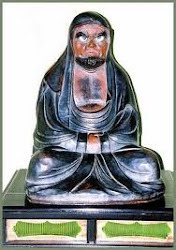 (and thus not related to the deity Bonten, this mix-up came later). On the day before the festival, there is a parade through town with a concours to win the most spectacular bonden. 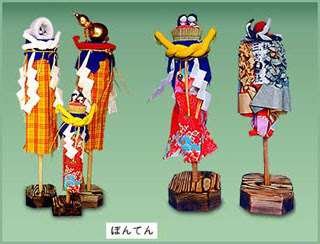 They carry the bonden and balance it on a strap around their bodies, swinging it high in the air before the shrine hall, before offering it to the deity. is in fact not related to the above festival, but for some reason has now been sold in stalls too. This ceremonial stick is only about 40 cm long and made from white wood of willows or a local tree called koshiabura (Acanthopanax sciadophylloides). The wood is cut in a special way to produce shavings for the thicker parts (kezurikake shijimu 削り掛け縮). This iwaiboo has been used in many parts of Japan in rituals to pray for children (kodakara　子宝) and a good harvest.
. . . CLICK here for Photos of Asakoa shrine !
. WKD : The New Year . 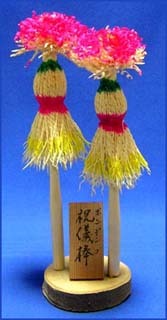 kayuzue 粥杖 (かゆづえ) "rice gruel stick"
This stick was used to stir the rice gruel for January 15 celebrations. 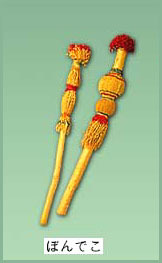 It could be used to hit a woman on her behind with the wish for fertility, when this stick was symbolizing the male organ. The custom is still practised in some rural mountain areas.